2017 MCEP graduating students, from left: Alexis Clarke, Danielle Semko, Aleah Berens, Charlene Anderson. Put Alexis Clarke into any situation involving surgery and she immediately focuses on the scenario unfolding before her. 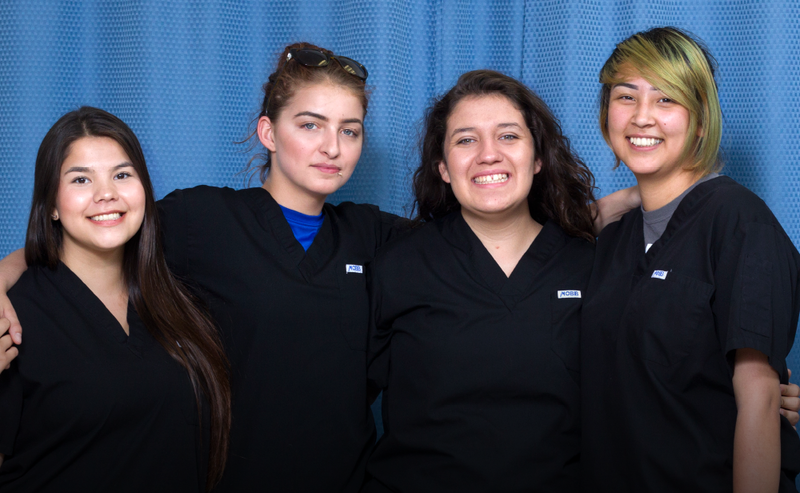 That's because becoming a surgeon is a life goal for Clarke, one of five students who recently graduated from the Medical Careers Exploration Program at Children of the Earth High School. The program, which is designed to introduce students to the possibility of a career in health care, was a perfect fit for Clarke. "I want to become a surgeon," she says. "I really liked watching surgery at Health Sciences, where I saw a liver resection and surgery on a hand. Then there was the Misericordia, where I saw eye surgery, and here at Pan Am, where they do surgery on knees and shoulders." 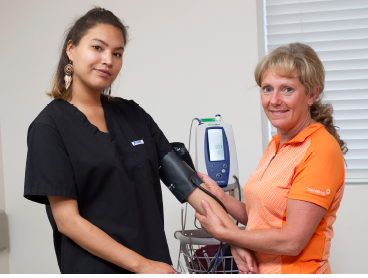 Once LeeAnne Gullette, a research coordinator with the Pan Am Clinic Foundation, showed Alexis Clarke how to use the controls on the training machine, the student started practising how to repair a tear in a meniscus of a knee. To Gullette's surprise and delight, Clarke completed the exercise. "I really like this," said Clarke, pointing to the machine. "Can I have one of these?" Clarke has applied to attend the University of Winnipeg in the fall, and then hopes to apply to the University of Toronto's Life Sciences Department, a path she hopes will eventually lead to medical school. Unlike the other students in MCEP, who apply to the program in Grade 9, Clarke came to Children of the Earth in the second semester of Grade 10. It didn't take long before the school switched her from the regular track into MCEP. "My favourite courses were pre-calculus last semester and chemistry this semester," she says, adding she loves anything to do with medicine. Her teacher, Kirsten Dobriansky says Clarke was a bright student, dedicated to learning and passing on cultural traditions and teachings from her grandmother. "She's kind, compassionate, thoughtful, and is always building others up and seeking out ways to support others," she says. "She puts the needs of the group first and looks at situations in a unique way to provide thoughtful feedback." Along with Clarke, four other students graduated from MCEP this past spring. Launched in 2007, the program was created by the Winnipeg Regional Health Authority and the Winnipeg School Division in part to help boost the number of Indigenous people working in the health-care system. Currently, Indigenous people make up about 11 per cent of the population (according to the 2011 Census), but only six per cent work in health care. Students enrolled in the program at Children of the Earth take the usual core subjects, plus the MCEP course, which is designed to support clinical practicums at various facilities in the city, including the Pan Am Clinic, Health Sciences Centre Winnipeg, Misericordia Health Centre, Red River College and Grace Hospital. The course includes material about the body's systems, anatomy, physiology, and also customer service. The students also learn traditional Indigenous ways of healing and medicine, and work on information communication technologies to enhance their computer skills. Students in the program receive $1,000 toward post-secondary education from the province's Bright Futures program, for each year of high school they complete. "The 2017 graduating MCEP students are some of the strongest young women I have had the pleasure of teaching," says Dobriansky. "They display a high level of resiliency and dedication. They are determined and hardworking young women with high aspirations which I am confident they will able to achieve. Having taught this group since Grade 10, I have seen tremendous personal and academic growth in each of them." Christine Daniels learns how to do a blood pressure reading from Annette Kressock, a registered nurse who works in the minor treatment area at Pan Am Clinic. Thanks to the practicum placements she's had at different Region facilities and the MCEP courses, Christine Daniels is aiming for a career in nursing. "We've seen as much as possible," she says, adding some of the health-care areas she enjoyed the most included surgery, x-ray and other diagnostic services, the cast clinic and minor treatment areas. "My plan is to take first year at University of Winnipeg, and then apply to nursing at Red River College." Daniels' favourite subjects at Children of the Earth included pre-calculus, biology, chemistry and English, although she's not a fan of history. "We have an amazing teacher, Kirsten Dobriansky," she says. "She really gets into the subjects, especially science and medicine. One of my favourite things was when she helped us memorize all the bones in the body." Daniels is definitely hard working, and handled a part-time job as well as her school work, according to Dobriansky. "She sets goals and works tirelessly to achieve them, doesn't let anything stand in her way, supports others around her." Danielle Semko learns how to adjust an X-ray machine at Pan Am Clinic from medical radiation technologist Cayla Mooney. 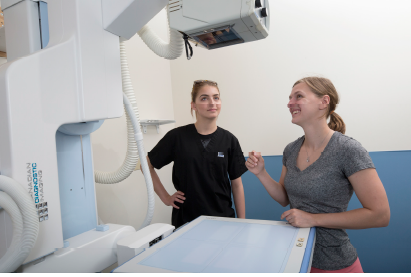 One of the best moments in the Grade 12 practicum for Danielle Semko was watching the staff work with patients in the Radiation Therapy Department at Health Sciences Centre Winnipeg. "They would inject people with radiation and then scan them for cancer," she says. "Watching surgery was also interesting." Semko is thinking of applying to become a paramedic through Red River College. She'll first have to finish a first year university course, possibly at University of Winnipeg. "I'm thinking of becoming a paramedic because it's an essential link in the health-care system," she says. Semko was not only attending school and practicum, she was balancing a part-time job at the same time, according to her teacher. "She goes above and beyond to challenge herself and push herself out of her comfort zone to achieve personal growth," says Dobriansky, adding that Semko is determined, resilient, protective of others, an artist and has a great sense of humour. Not everyone who graduated this past spring is interested in a health-care career. But they still valued the MCEP for its strong academic foundation and push toward post-secondary education. Going through three years of MCEP gave students an opportunity to experience a variety of careers and assisted them to choose careers that interest them," says Dobriansky. "Attending practicum allows students to gain valuable work experience, as well as increase their self-efficacy to view themselves as successful professionals. It sets them up for success in whatever career they choose." LeeAnne Gullette, a research coordinator with the Pan Am Clinic Foundation, explains how the rotator cuff muscles and tendons work to Aleah Berens. Aleah Berens wants her dreams to take flight, quite literally. She plans to become a commercial pilot. "I've applied to go to Providence College, for four years to get my pilot's license," she says. "Then, I'll go on to Harv's Air to get the commercial license, and also to Red River College to go into aircraft maintenance after that." Berens' favourite subject in high school was gym, because it got her moving. She doesn't like sitting still at a desk, and would rather be working with her hands. "My grandpa owns a plane, and whenever we go north to Poplar River, he takes me flying," she says. According to Dobriansky, Berens is, "Highly involved in powwows, dancing, beading, creating her own regalia," and is a compassionate young woman, involved with her community, and who always steps up to support others. Charlene Anderson plans to pursue a carpentry diploma at Red River College and is planning to work with a carpentry business this summer. Some of Anderson's favourite memories in the Grade 12 practicum included working with the vascular access team at Health Sciences Centre Winnipeg. "The man I was learning from let me flush out an IV," she says, adding that another experience she enjoyed was watching plastic surgery at HSC. According to Dobriansky, Anderson has a great sense of humour, is insightful, a good artist and athlete, and is a wonderful support for her friends. "She's always looking for more ways to reach out and help others." Over the past nine years, 42 students have graduated from the program. Dobriansky says each and every one has gained from the experience. Mary Kay Turner, an orthopedic technologist / athletic therapist at Pan Am Clinic, works with Charlene Anderson in the cast clinic. "Some of the benefits of MCEP for the students who complete the program are to gain an insight into the inner workings of the different opportunities within the field of health care," she says, adding the bursary for successful completion of the program also aids in subsidizing post-secondary costs. "As well, they gain valuable skills in communication, professionalism and work experience that they can take with them into their future chosen career fields."